The end of the year is approaching. 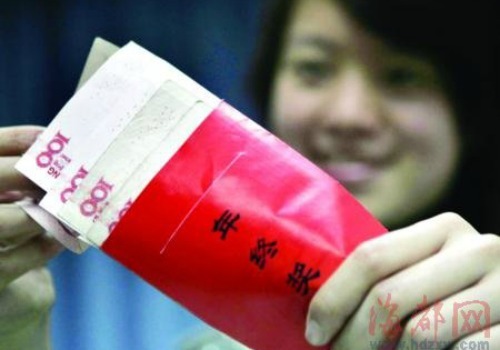 This means that Chinese employees start to look forward to their annual year-end bonuses (年终奖). It is a tradition in China that can be both stressful and pleasant for full-time workers: is the boss finally giving out that promised bonus, or do they have to wait another season? The year-end bonus became a hot topic on Sina Weibo this week. A number of China media, including China Daily (中国日报) and Caijing (财经网), posted the news of a Chinese boss paying terminated employees the year-end bonuses they were supposed to get four years ago. Over 90 employees were forced to leave the Chongqing-based company in 2011 due to financial problems, and the employer failed to give them their year-end bonuses that year. Since the company has been doing better in 2015, the boss decided to reissue the bonuses that he promised his former employees four years ago. The news received much attention on Weibo, where the hundreds of netizens responding to this post can be roughly divided into two camps: those who praise the Chongqing employer for being “such a wonderful boss”, and those who say that they just want to repost this news to their own boss as a subtle hint. According to PXC Consulting, a well-known human resource research organization in China, over 80% of employers paid year-end bonuses to their employees in 2015. Within these enterprises, 77.6% pay more than RMB 5,000 (±US$1,058), and 4.1% pay more than RMB 30,000 (±US$4,645) to each employee. Of all cities, Shanghai tops the ranking with the average employee working there receiving roughly 8,515 yuan (±US$1,319) on top of their monthly salary. The height of the year-end bonus largely depends on one’s profession. People employed in the finance, e-commerce, automobile, and aviation sectors rank amongst the top earners when it comes to year-end bonuses, PXC Consulting reports. The year-end bonus is also called the ‘December bonus’, which means that the bonus is supposed to be paid in December of every year. But over recent years, more and more companies choose to pay the bonus in the middle of the year or divide it into seasons, to make sure their employees don’t leave right after receiving the bonus. It is up to each employer how much they pay for the year-end bonus, and when they pay it. Some employers have now turned the ‘year-end bonus’ into a ‘stay-and-don’t-leave bonus’. This way, they can ensure their factory workers will come back after the Chinese New Year. Since companies care about keeping good employees for the development of their businesses, and employees care about the receiving a bonus to boost their income, the delay of bonus-giving seems like a clever solution for many companies. Pressured by rising prices, the timing of when to pay the year-end bonus and deciding on its amount seems increasingly crucial to employees. Therefore, most companies do not add the bonus to their labor contracts. Whether or not they give out the bonus depends on the company’s situation and recent profits. But in reality, many employers are not yet willing to contractually agree to give out the year-end bonus. They do not want to risk violating the contract once they cannot afford to give out money at the end of the year. Simply not putting anything on paper is the safer route to take. The year-end bonus will be a hot topic for the coming weeks, as some workers will be surprised and some disappointed. It has created some social media hypes over recent years. Last year, a Guangzhou Internet company gave away 10 Audi cars as year-end bonuses for its employees. Another company reportedly gave out 1 RMB lottery tickets as a year-end bonus, making some employees resign on the spot. This article was published on What’s on Weibo.